03-19-2017 The first egg is here! 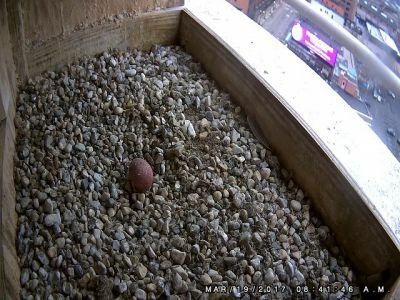 Rebecca laid the first egg early in the morning on Sunday, 3/19/2017, which is the same date as the first egg in 2016. Rebecca stood guard over the egg most of the day on Sunday and Kewpee spent some time at the nest as well. Generally, they do not consistently incubate the eggs until there are three or more. Rebecca has laid four eggs each of the last three years, so time will tell what this year brings.